Spring,summer and autumn is best season for playing golf,also season of bad reason like frequent rain. Beloved ball is exploded under the sun for long,plus wind and rain make it fade,thus reducing its lifespan. 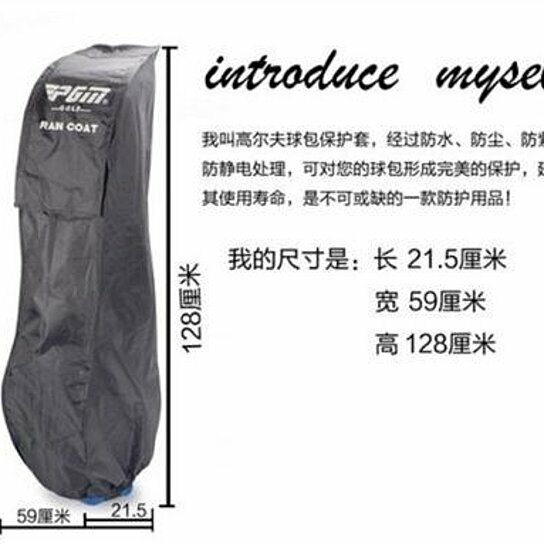 You need a protector to resist bad weather and perfectly protect golf bag!This golf bag rain cover is treated with waterproof,dustproof,ultraviolet-proof and anti-static,naturally resist time and weather;boutique printing,stronbg three dimensional feeling,highlighting bag's top grade;delicate lathe-hand rolloff craft makes protection both practical and beautiful;tightness design is closer to bag,keep bag clean and dry,as well conveninet to carry;it need protection as it is your favorite.